We stock a variety of truss components to suit light duty, medium duty and heavy duty video screens. We can also provide chain motors and production rigging as required. 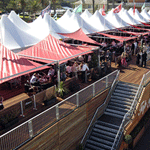 Our superior Plettac brand scaffold and decking system works with public-style handrail and stair access, and is rated above and beyond the minimum 5kPA weight capacity dictated as the Australian Standard. 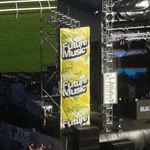 Using our Plettac and Kwikform modular scaffold systems, we are able to create any number of bespoke scaffold structures to suit set support, production support, or give your event the classic industrial feel. The endless possibilities of designing with scaffold is only limited by your imagination. 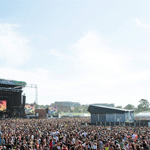 We stock a variety of Front of House Structures from simple and small, to small footprint with multi-level workspace, to large multi-tiered structures. We have something for every event. 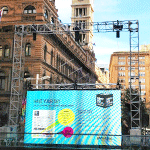 We can provide multiple solutions to events that require flown PA. From light duty, medium duty to heavy duty truss delay towers, through to scaffold towers which are ideal for wrapping in printed mesh to further advertise your brand. 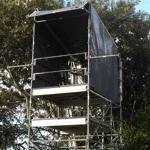 We can provide a variety of spot tower solutions for all your production needs. 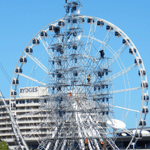 We have tall and slim truss towers, as well as scaffold options to give you a larger work platform to operate from. 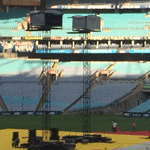 Our camera platforms are an ideal addition to any broadcast event, ensuring the cameraman can operate from above the crowd, while keeping both himself and his equipment securely weatherproofed. 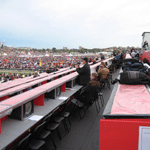 Tri-Point have extensive experience in designing and installing bleachers and press tribunes on various major events. We can help design your temporary structure, and will provide you with drawings so you can see the end product even before it’s built.